Manuel J. Rosales is President and Tonal Director of Rosales Pipe Organ Services, Inc. He was born in New York City in 1947 and raised in Los Angeles. On his 14th birthday Manuel's father took him to see the movie Fantasia and he became enthralled with the music of J. S. Bach. An opportunity to work with his church's organ tuner led to an immediate realization that pipe organ building was going to be his life's work. He served his apprenticeship with the Schlicker Organ Company of Buffalo, New York, from 1968 until 1973. In 1973, Manuel Rosales returned to Los Angeles to serve as the area service representative for the Schlicker Company and established his own firm, Rosales Pipe Organ Service. In 1980, Rosales Organ Builders, Inc., was formed during the construction of his Opus 9, the firm's largest instrument to that time, for the First Presbyterian Church in Granada Hills, California. The success of this two-manual 32-stop instrument led to several other contracts including his now-famous Opus 11, a 52-stop instrument for Trinity Episcopal Cathedral of Portland, Oregon. Frequently, foreign study tours are necessary to research projects at the Rosales firm. In 1982, Manuel Rosales joined Charles Fisk and Harald Vogel on an organ study tour of Holland and northern and eastern Germany. This association led to his involvement in the finishing of the Fisk organ at the Memorial Church at Stanford University. In 1988, accompanied by organ builder and historian Susan Tattershall, Manuel Rosales traveled to Mexico to study antique Mexican organs. During this trip he investigated and analyzed the construction of an organ in this style for Mission San José in Fremont, California, his Opus 14. From 1989 until the present, Rosales has made eight trips to France to study classical (Clicquot) and symphonic (Cavaillé-Coll) organs. These study trips influenced the construction of Rosales Opus 16, a three-manual 62-stop organ for the First Presbyterian Church of Oakland, California, and aided in finalizing tonal design for Rosales Opus 21, a three-manual 70-stop organ for the Shepherd School of Music at Rice University in Houston, Texas. This important instrument, a collaboration between C. B. Fisk and Rosales, was dedicated on April 7, 1997. In 1999, he traveled to England to study the work of the renowned organ builders Edmund Schulze and T. C. Lewis. In 1998 Manuel Rosales completed Opus 23, an innovative three-manual 38-stop organ for Saint Cyril of Jerusalem Roman Catholic Church in Encino, California. Also in 1998 Rosales Organ Builders provided voicing, tonal design, and pipe scaling for the 54-stop Glatter-Götz organ in the Claremont United Church of Christ, Congregational, in Claremont, California. In the summer of 2000 Opus 30 for St. James Cathedral in Seattle, Washington, was completed prior to the American Guild of Organists (AGO) national convention. Recitals, services and competitions featured concert organist Nicholas Kynaston, cathedral organist Joseph Adam and the finalists of the AGO National Competition in Organ Improvisation. The cathedral is a superb example of neo-romantic architecture with beautiful, rich, and clear acoustics. 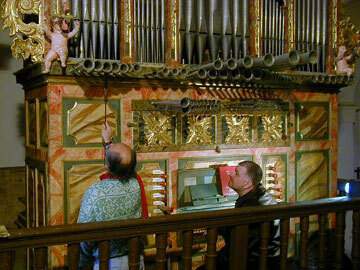 Opus 32, a collaboration with Parsons Organ Builders of Canandaigua, New York, was completed in 2004. This modest instrument resides in the rear gallery of the lovely Spanish-style sanctuary of First Lutheran Church in the oceanside community of Venice, California. Currently, Rosales Pipe Organ Services is engaged in the voicing and tonal finishing of the recently-installed Opus 35 that is a collaboration with Glatter-Götz Orgelbau for the Augustana Lutheran Church in West St. Paul, Minnesota. Also, the completion of the releathering and restoration of Skinner Organ Company Opus 446 at St. John's Episcopal Church in Los Angeles is in its final stage. Opus 33 for St. Stephen's Lutheran Church in Monona, Wisconsin, is also a collaboration with Parsons Organ Builders and will be installed this fall with tuning and voicing completed for Christmas 2005. Manuel Rosales is a leader in the preservation of historic organs, particularly the instruments of pioneer Los Angeles organ builder Murray M. Harris. He served as a consultant for the restoration of the Harris organ at Stanford University, and as the project consultant for the restoration and reinstallation of a 1911 Harris organ at St. James' Episcopal Church in Los Angeles. Currently he serves on the technical advisory board for the restoration of the Wanamaker Organ at the Lord & Taylor Department Store in Philadelphia, at whose core is a 1904 Murray M. Harris of 146 stops. Manuel Rosales is a member of the International Society of Organbuilders (ISO) and the American Institute of Organbuilders (AIO). He is also a founding member of the Pacific Southwest Chapter of the Organ Historical Society (OHS), a past national councillor for the Organ Historical Society, and served as a member of the executive committee of the former Pasadena Chapter of the American Guild of Organists. In 1998 he joined the board of directors of the Ruth and Clarence Mader Memorial Scholarship Fund. Frequently called upon as lecturer, Manuel Rosales has spoken to the Los Angeles and Long Beach Chapters of the American Guild of Organists; the AGO National Conventions in Atlanta and Los Angeles; the Westfield Center for Keyboard Studies in Tempe, Arizona; the House of Hope Organ Institute in St. Paul, Minnesota; the San Anselmo Organ Festival in California; the National Association of Music Librarians; Organ Alive! at the First Congregational Church of Los Angeles; several times at American Institute of Organbuilders national conventions; and for the Acoustical Society in America. In May 1999 he taught two courses in the "Art of Voicing String Pipes" sponsored by the International Society of Organbuilders in Strasbourg, France. These were repeated in April 2001 for the American Institute of Organbuilders mid-winter seminar in Chicago, Illinois. Rosales Pipe Organ Services is in the completion phase of the world-renowned organ at the Walt Disney Concert Hall in Los Angeles as the final adjustments are made to the voicing. The unusual and innovative façade was designed jointly by architect Frank O. Gehry and Manuel Rosales. The instrument was built and installed by Glatter-Götz Orgelbau. As part of the 2004/2005 inaugural season of the Walt Disney Concert Hall organ, Manuel Rosales has introduced the organ to members of the press, various groups of donors, volunteers, members of the Music Center staff and the Los Angeles Chapter of the American Guild of Organist with illustrated lectures and organ demonstrations. Manuel Rosales has been named Curator of the Walt Disney Concert Hall Organ.